More than any other target, 4.7 touches on the social, humanistic and moral purposes of education. It explicitly links education to other SDGs and captures the transformative aspirations of the new global development agenda. The GEM Report focuses on the proposed global indicator and examines how global citizenship and sustainable development are included in system-wide interventions, curricular materials such as national curriculum frameworks and textbooks, and teacher education programmes. Identifying indicators to monitor knowledge, skills and attitudes needed to promote sustainable development is arduous. The report examines initiatives that could be used to monitor acquisition of relevant knowledge and skills, as well as youth and adult attitudes. Target 4.7 is closely aligned with a lifelong learning framework, and does not specify the education levels or age groups to which its themes apply. The proposed global and thematic indicators mainly focus on children and adolescents in formal education. None of the proposed thematic indicators explicitly capture adult learners in non-formal and informal education. Curricula are the main way knowledge and skills to promote sustainable development and global citizenship are typically conveyed. One thematic indicator proposes measuring national implementation of the World Programme on Human Rights Education framework. The indicator captures elements of target 4.7 as regards human rights, fundamental freedoms and tolerance, among others. Another proposed thematic indicator for target 4.7 – the percentage of schools providing life skills-based education on HIV/AIDS and on sexuality – responds to five elements of target 4.7: human rights, gender equality, culture of peace, non-violence, and knowledge and skills to promote sustainable development and lifestyles. The inclusion of this indicator in education management information systems and schoolbased surveys has been piloted in some countries, which will allow for better future monitoring. Further research into subject curricula would aid in understanding progress on target 4.7. Systematic lists of national curriculum frameworks and related materials are needed. 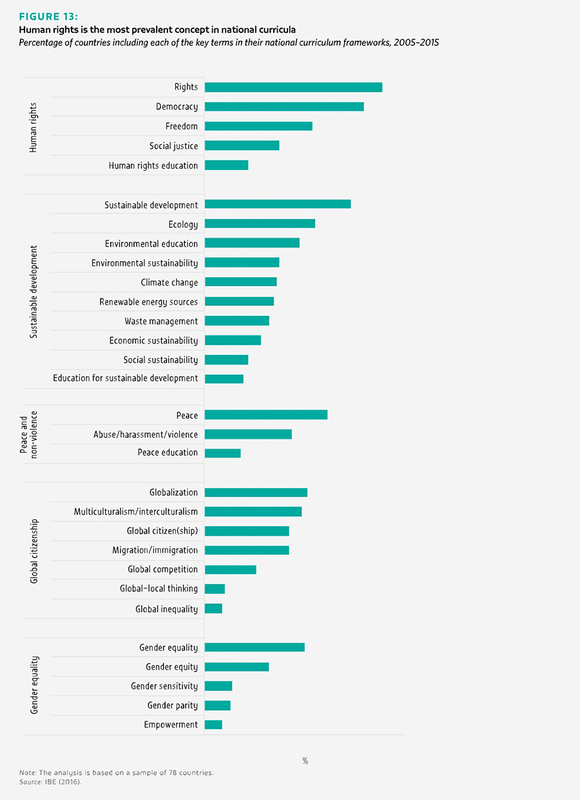 GEM Report analysis of over 110 national curriculum framework documents for primary and secondary education in 78 countries showed that, over 2005–2015, three-quarters of countries had some emphasis on sustainable development issues, but far fewer made reference to terms related to global citizenship. Gender equality was also less prevalent: Less than 15% of countries integrated key terms such as gender empowerment, gender parity or gender-sensitive, while half mentioned gender equality. Recent advances in textbook content analysis are promising for gauging curricular content. For the GEM Report, three data sets on secondary school textbooks in history, civics, social studies and geography were compiled. Analysis showed close to 50% of the textbooks mentioning human rights over 2000–2013, compared with around 5% over 1890–1913. Just above 10% of textbooks in Northern Africa and Western Asia mentioned women’s rights in the last decade. Such analysis shows it is possible to develop valid and reliable measures using textbooks. A regular monitoring mechanism should be established to provide globally comparable data on textbook contents. Teachers should be prepared to teach in areas related to sustainable development and global citizenship. Only 8% of 66 countries surveyed integrated sustainable development in teacher education in 2013, up from 2% in 2005. Teacher training programme content is seldom readily available, but some information, mostly regional, has been collected. Stronger efforts are urgently needed to assess concepts in target 4.7 for teacher preparation and training. Applying a standard coding protocol to the curricula of teacher training institutions would make it possible to analyse the effectiveness of professional development in preparing teachers to respond to various communities of students. Students are introduced to sustainability and global citizenship issues not only in school but also through academic clubs, student associations, sport, debate clubs, theatre productions, music groups, volunteer work and other activities. An analysis for the GEM Report found that well-designed, inclusive activities accessible to all improved conflict resolution and social cohesion, increased awareness of legal frameworks and concepts related to human rights, and promoted a sense of global citizenship. Existing data collection tools pay insufficient attention to the quality of experiences and development processes in such activities. The absence of shared reporting standards limits the chance of obtaining globally comparable and reliable data. Monitoring the core aspiration of target 4.7 – acquisition of knowledge and skills needed for global citizenship and sustainable development – is not easy. A basic, interdependent understanding of world history, geography, international institutions and global processes could serve as a starting point, but few cognitive assessments exist in this area. In many countries, only two-thirds of students are familiar with the Universal Declaration of Human Rights. A major challenge has to do with tension between local values and increasing global commitments. Recent initiatives seek to improve monitoring mechanisms for target 4.7 regarding adolescents, mainly in secondary education. In 2016, UNESCO and the International Association for the Evaluation of Educational Achievement officially began collaborating on measuring global citizenship and sustainable development knowledge. The Southeast Asia Primary Learning Metrics, focusing on global citizenship in grade 5, aims to develop comparative assessments that are more attuned to local conditions.